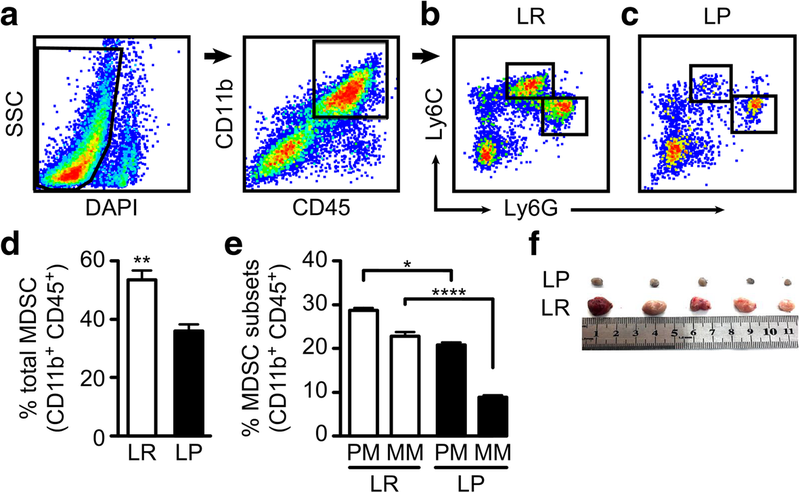 A key pathological feature of solid cancer is the massive mobilization and infiltration of immune cells into the lymphoid organs and the tumor microenvironment. Solid tumors are known for their ability to recruit and modify immune cells and endothelial cells which form the tumor microenvironment . A growing body of evidence suggests that host immune cells with a suppressive phenotype pose a significant challenge to the success of immune-enhancing anticancer therapy [2–5]. Among these suppressor cells, myeloid-derived suppressor cells (MDSCs) and regulatory T cells (Tregs) have been shown to increase significantly in number in hosts with advanced malignancies [6, 7]. MDSCs are a heterogeneous population of cells that expand during cancer, inflammation and infection, and have a remarkable ability to suppress T-cell responses . There are two main subsets of MDSCs: polymorphonuclear MDSCs (P-MDSCs), which are similar in phenotype and morphology to neutrophils, and monocytic MDSCs (M-MDSCs), which are similar to monocytes [9–11]. In cancer, several differences in distribution and functions have been observed in these MDSC subsets. In the peripheral lymphoid organs, there are more P-MDSCs than M-MDSCs; these P-MDSCs have a relatively modest suppressive activity and play a key role in the regulation of tumor-specific immune responses, facilitating the development of tumor-specific T-cell tolerance. M-MDSCs in the peripheral lymphoid organs lack the capacity to differentiate into macrophages (MØ) and dendritic cells (DC). In contrast, MDSCs in the tumor microenvironment are more suppressive, mostly M-MDSC, and can differentiate into tumor- associated macrophages (TAMs)(reviewed in ). 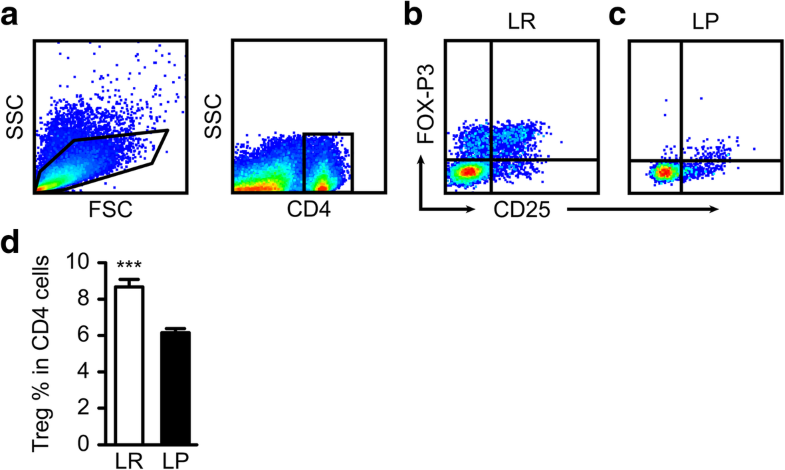 This further highlights the importance of novel strategies to inhibit multiple subsets of MDSCs both in the peripheral lymphoid organs and in the tumor microenvironment. Several MDSC-inhibiting drugs have been tested but only against splenic MDSCs, highlighting the need for the development of immune-enhancing drugs and interventions to target MDSCs in the tumor microenvironment. Tregs are a subset of immunosuppressive T cells that are involved in immune homeostasis and self-tolerance, fetal maternal tolerance, infection, autoimmunity, graft-versus-host immunity, and tumor immunity . In the tumor microenvironment, Tregs contribute to the development of immunosuppression, immune evasion and cancer progression [16, 17]. 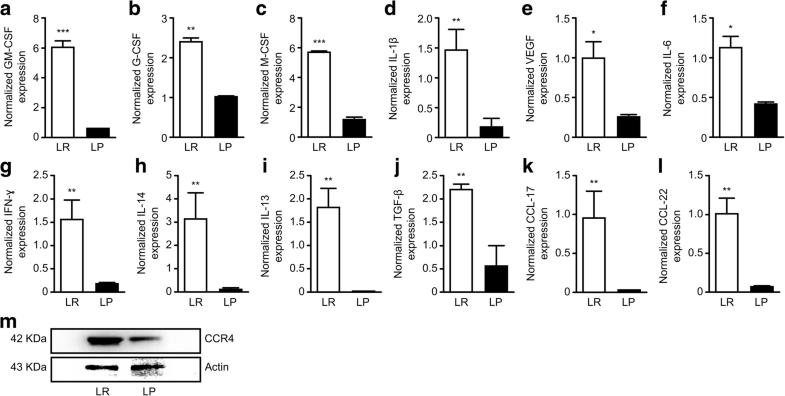 Tregs are recruited to the tumor microenvironment via interactions between tumor-secreted chemokines and their receptors (mainly CCL17/CCL22-CCR4, CCL5-CCR5, CCL28-CCR10 and CXCL9/10/11-CXCR3), converted to a suppressive phenotype by TGF-β, and efficiently expanded in the presence of tumor-derived IL-10 and TGF-β . The accumulation of Tcell-inhibiting [18–20] Tregs in the tumor microenvironment and peripheral blood of cancer patients has been reported in several papers and is correlated with a poor prognosis , suggesting that immunotherapeutic approaches targeting Tregs could prolong patient survival. 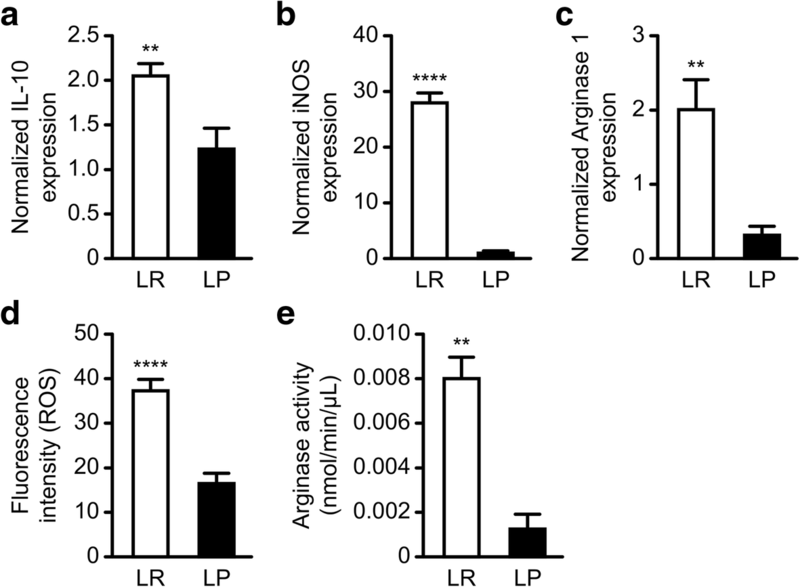 Although malaria is a serious disease caused by the protozoan genus Plasmodium, several reports have suggested that malaria could stimulate the host innate and adaptive immune systems to combat cancer [22–25] by stimulating IFN-γ production, activating natural killer (NK) cells, γ δ T cells, inducing the maturation of DCs and stimulating T-cell proliferation [24, 26]. Available evidence indicates that the STAT3 pathway is crucial for MDSC differentiation, survival and immunosuppressive functions . Several reports have indicated that activated STAT3 modulates the expression of several target genes involved in cell cycle regulation, angiogenesis, tumor invasiveness and apoptosis [33–35], and that the disruption of STAT3 in myeloid cells alters immunosuppressive cell abundance . We therefore examined whether Plasmodium infection could inhibit the phosphorylation of STAT3 and other STAT pathways including those of their downstream proteins – especially those involved in cell survival and immunosuppression. 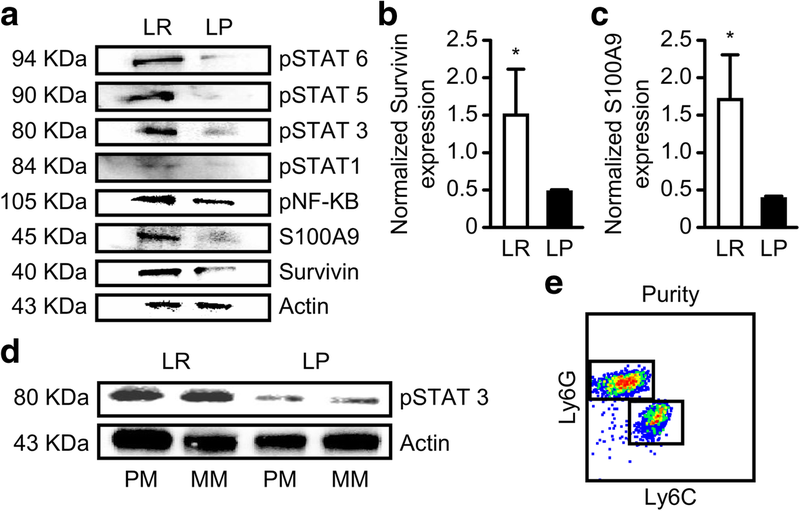 We used western blotting to assess the protein expression levels of p-STAT1, pSTAT3, pSTAT5, pSTAT6, NF-kB, Survivin and S100A9 and QRT-PCR to assess Survivin and S100A9. Our western blot results showed that, compared to the control, Plasmodium treatment inhibited the protein expression of p-STAT1, pSTAT3, pSTAT5, pSTAT6, NF-kB, Survivin and S100A9 (Fig.4a). Because the subsets of MDSCs have different immunosuppressive potentials in the tumor microenvironment and because STAT3 is the most crucial factor for MDSC activation, we sorted the individual subsets (P-MDSCs and M-MDSCs) for additional western blot analysis. Our results indicated that Plasmodium treatment inhibited the expression of pSTAT3 protein in each of the MDSC subsets analyzed (Fig.4d). Furthermore, we carried out QRT-PCR on the sorted MDSCs to examine the mRNA expression of two downstream proteins (Survivin and S100A9). Our results indicated that Plasmodium treatment downregulated the mRNA expression level of Survivin (Fig.4b) (P < 0.05), and S100A9 (Fig.4c) (P < 0.05) compared to the control. These results suggest that Plasmodium infection could modulate MDSC proliferation and survival through inhibition of the STAT pathways. Tumor growth is often associated with both the stimulation of antitumor T cell responses and a parallel induction of immune suppression. The balance of these two events determines, to a large extent, the prognosis of the disease. In cancer patients, the tumor-specific Tcell response has been found to correlate with improved outcomes [40–44]. 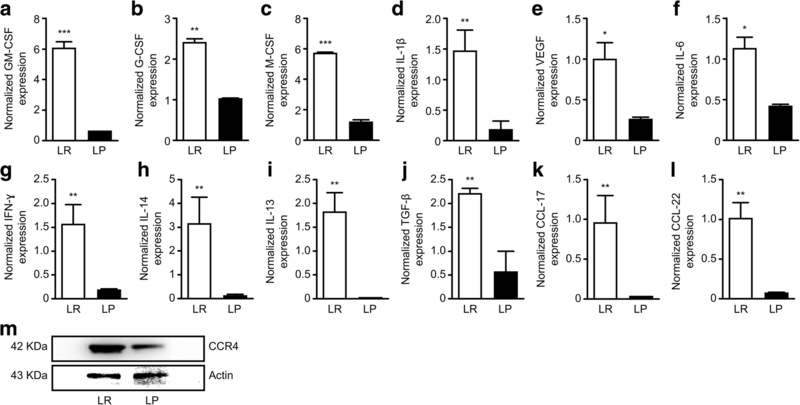 However, the tumor-specific immune response is compromised by the recruitment of immunosuppressive cellular and molecular mechanisms within the tumor microenvironment. Several reports have indicated that immunosuppressive cells mobilized into the tumor microenvironment by tumor-derived factors and cytokines are a major cause of the failure of novel immunotherapies and chemotherapies [45–47]. Among these cellular infiltrates, MDSCs and Tregs are believed to play a major role in the suppression of antitumor immune responses [48–50]. Srivastava et.al, reported that targeting MDSCs could augment the antitumor immune response against lung cancer . 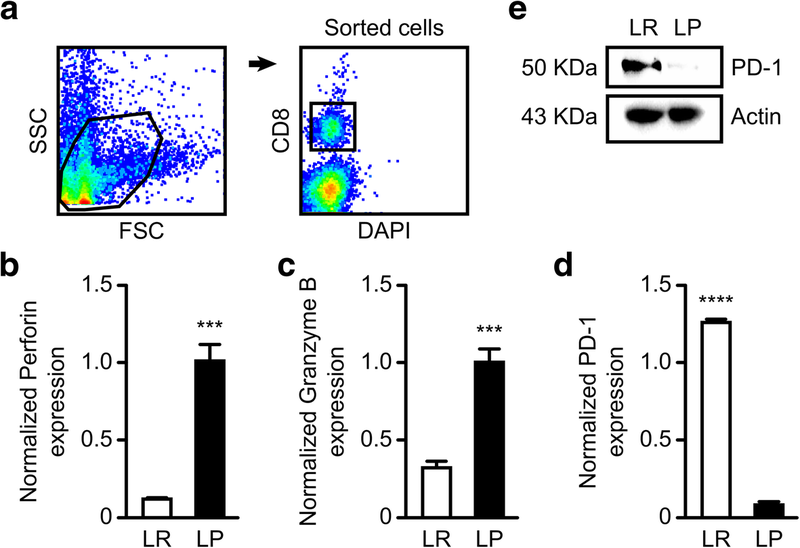 We previously reported that Plasmodium infection could induce potent innate and adaptive antitumor immune responses in a lung cancer mouse model , but the effect of Plasmodium infection on the immunosuppressive abilities of MDSCs and Tregs in the tumor microenvironment is not yet known.